This project report (click entry title for link) describes the attempt to assemble a radically different approach to library automation: an enterprise-wide, web-services based series of modules that work well together. Click the title of this link to go to a lead article in the Planning Commissioners Journal. The topic, once unusual, now has gained traction: libraries are becoming "important 'economic engines' of downtowns and neighborhood districts." See the link within that story about the Hudson, Ohio library, about which the author writes, "Why in today's internet and digital age would libraries need to be larger? More importantly, why do they seem in even greater demand? What I've been finding so far .... is that in today's digital age there's even more demand for public libraries. The role of the library has also been evolving, taking on a broader range of community-related functions." "In 2006, the most recent year for which data is available, there were some 1.4 billion visits to the nation's 9,208 public libraries. "To put library visits in perspective, consider that in 2007 the attendance at major league baseball games was 81 million and NFL football, 22 millions -- add in NCAA men's and women's basketball (43 million) and football (49 million) and the total is less than 15 percent the number of visits to public libraries." This is a report that should find its way to the desk of every town administrator and/or city councilperson in the country. I can still remember -- particularly around major holidays -- when Union Station was packed. There were throngs of people, all ages. Train stations had a grandeur and civic significance that airports really don't. 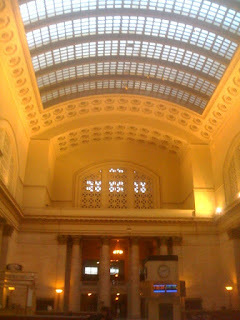 In Chicago at the recent ALA conference, I visited the station and although the building seems lovingly restored, it was nearly deserted, as this photo records. The other thing I love is that the broad marble steps into the station are scooped out -- the weight of millions of footsteps. Amazon putting ads in ebooks? Click the title to read this. You have to admit, the minute you hear of it, you know it's inevitable. Why not offer contextually sensitive, up-to-the-minute advertisements on your Kindle? In order to, um, enhance the reading experience? After all, when you're reading a paper book, there's all that unused white space: the margin at the top. The margin at the right. Wasted! Just think how the reading experience could be improved by pulsating multi-colored links to whisk you away from Upton Sinclair's "the Jungle" to free coupons for McDonald's! Yessirree, there's money in literature. I can hardly wait. I hope soon to interview Dave Cullen, local reporter, whose book on the Columbine High School shooting is based on "hundreds of interviews with most of the principals, examinations of more than 25,000 pages of police evidence, [and] countless hours of video and audiotape." I just finished it last night. It's a harrowing book, vivid and thought-provoking. We've contacted him for our "Authors @ Douglas County Libraries" Internet video series, and he seems willing. What impresses me most about Cullen is that he never takes the easy option. All parties -- evangelical churches and families, angry parents, SWAT team members, the media, and even the killers, Eric Harris and Dylan Klebold, all come under consideration in a way that is both dispassionate and compassionate. 15 people died at Columbine (including Harris and Klebold). Twice that number were injured. But the plan was considerably worse. If the bombs, made and planted, had gone off as intended, the death toll could have been 500 or more. Highly recommended -- the definitive book on the tragedy to date. I just got a message from Nancy Bolt, the former state librarian of Colorado. She is the first to inform me that in the latest Hennen's American Public Library Ratings, we are #1 in the country. The data is actually a little old -- based on 2006 numbers. We've done way better since then. But it marks our entry among the libraries serving populations between 250,000 to 499,000. My warm congratulations to my extraordinary board, staff, and of course, the enthusiastic patrons of Douglas County. You can see the rankings at www.haplr-index.com/HAPLR100.htm.